Journal Of A Petite Diva: WHICH WAY ARE WE HEADING NIGERIA? Lately we have been hearing about PDP members defecting to APC and some PDP governors meeting with APC leaders which proves my point that all these politicians are the same thing. So why am I glad that people seem to want a change? It is very simple. It means people have had enough. It means people have realised that we can be better. It means people know their rights and know that they can change the way things are. Nigeria is in a nasty state and we are all to blame. When you bribe someone to do what they are paid for, you are part of the problem. When you cut the line when people are queueing, you are part of the issue. When you throw thrash on the road, you are part of the problem. It is said that the first step to tackling an issue is recognising or defining the issue. I am glad that Nigerians have identified the issue. Now the second step is to define our goals and make plans. And since we are all not meant to be senators or governors or Presidents we need to choose people that we trust can do it. And when they don't do what we voted them for, we vote them out. It is amazing how people think that to be in power is their birthrights. I have seen and heard that some senators are seeking re election for the third/fourth and fifth term. WTH?! I am now wondering whether senate is a monarchy. Is it a birthright? As if that was not bad enough I read recently read on our desperate the presidency is determined to be in power. To the extent of allowing a military coup to occur. Yes, it is that bad! Previously I would never have believed the reports but lately I have come across a lot of information that before I have the chance to decide if it is true or not, the event has occurred. Someone said APC and PDP are the same and I agree but lately APC seems to be playing the game better than PDP. 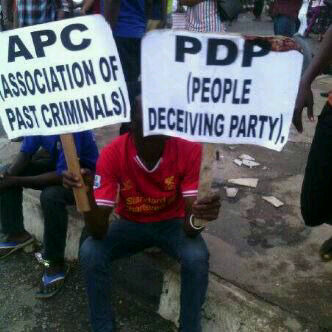 PDP has been on a smear campaign since they begun and they seem to be running out of ideas. They have accused APC of being a Muslim party (which they have recently changed to say that Muslims in the north should not vote APC because it is a Christian party as it is reported here), then the certificate saga (in which the army has disgraced itself by allowing it to be controlled), then the law suits, then the most despicable of all, creating a hate documentary and paying 5 million naira per hour for it and having the audacity to drag the late sickle cell warrior daughter and late ex wife of the APC presidential candidate. The latest news being reported which unfortunately I believe is that the government is trying to prevent the elections from holding. According to the reports, three options to prevent a change in the government is being analysed. Check out this article to know more. And also check out this one. To say I am surprised is an understatement. I am mortified! Is it that bad?! What the heck is in that Aso rock? What?! Something is up! Because this is just out of the ordinary. But i take solace in the fact that God is taking control. He is showing them that their steps are foolish. They seem to be making one blunder after the other. Now the minority parties are involved in the dirty game but then again, they have nothing to lose. However the consequences would be greater than the presidency imagined. This article by Frisky Larr says it all. And as for APC, if eventually you get to the seat of work, the seat of sacrifice not power and you mess up, your day of reckoning would be on you faster than a speeding bullet. Nigerians know that we deserve better. God has blessed us tremendously and we won't allow mere men to ruin this country for us. So whether the person is a black, white, red, jewish, Christian or a Muslim or a southerner or a westerner or a northerner or an American I just want this country to move forward. SIMPLE!!! People try to stay safe and realised that at this moment you are an ireporter. Record any irregularities seen. Go and vote with your phones. Record the counting of the votes and take pictures of the recorded results, if possible follow the presiding officers to the collation centres and take pictures there too. Then upload the pictures and tag international news agencies. I wrote follow to the collation centres because when I was a presiding officer I was offered some money to go somewhere and change the results to favour the other party. Which I refused (I was scared as I was refusing the offer because anything could have happened). It is well with this country, amen. That is all for now guys. Thanks for stopping by.